Colors of Bangkok, our popular half day Bangkok bicycle tour, takes participants through a part of the Thai capital which they will never see on their own. A part where there is almost no traffic, just narrow streets and backyards. 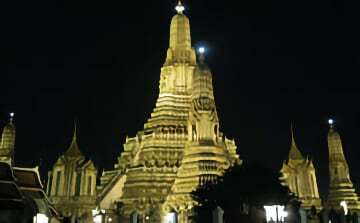 Bangkok as you have never imagined! After a quick bicycle fitting we start with our Bangkok bicycle adventure. During the first part of the tour we see stand alone villas, luxurious apartment buildings, town houses and in between shops, companies and small factories. We make a first stop at one of the many hidden local communities in Bangkok. We might call it a slum, but the local people call it ‘home’. The people who live here belong to the poorest people in Bangkok, but they are very friendly, polite and generous and give us a warm welcome every day. We walk through this small community and stop at the slum kindergarten. The very poorest children receive education here while their parents are working. Visiting slum areas makes you remind that life is not that easy for everyone. Recreational Bangkok Biking wanted to help to make this place a little bit better and in 2005 we made the decision to sponsor this kindergarten. We continue our Colors of Bangkok bicycle excursion in the ‘City of Angels’ and make a stop at a sweatshop before we arrive at the pier. Here we board a typical Thai longtail boat to cross the mighty Chao Phraya river. At the other side of the river we find ourselves back in the ‘Jungle’ or the ‘Green Lung’ of Bangkok, the greenest area in the city. We cycle on elevated pathways through lush vegetation and in the shade of coconut palms and banana trees. Recognize any plants from home? They sure are a whole lot bigger, aren’t they? Halfway the tour we stop at a local restaurant and provide a small Thai meal, Pad Thai (Thai noodles) or Khao Pad (fried rice). After our meal we visit a very old, non-touristy Buddhist temple. The guide will tell you everything about this temple and about Buddhism in general. Unfortunately, time has come to return to the pier where we take a short boat ride back to the hustle and bustle of Bangkok again. But before we arrive at our office/lounge we make a last stop at an open-air Muay Thai school. Muay Thai, or Thai Boxing, is the national sport and cultural martial art of Thailand and its origin dates back several hundred years. 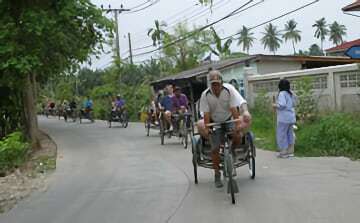 Participants on our Colors of Bangkok bicycle tour will learn and see how daily life passes by for Bangkokians. We take you off the beaten track and show you a different Bangkok, a ‘local’ Bangkok, far away from the well-known tourist areas. We set out a route which is traffic free for the majority, so you can fully enjoy the ride and the surroundings. You don’t need to be a cycling fanatic to join the excursion. The pace is relaxed and we make enough stops for taking pictures, explanation of sights, something to drink and relax. Colors of Bangkok will be an amazing Bangkok biking experience for young and old! Note: RBB reserves the right to change advertised itineraries, since schools and local shops may be closed during the weekend, school holidays and national holidays.